“Salvation” is seen as a rescue from “the wrath to come” (Matt. 3:7; Rom. 5:9; 1 Thess. 1:10; 5:9), though what form this wrath may take remains obscure. It does not necessarily refer to postmortem destinies. Though frequently mentioned in the Old Testament, God’s “wrath” is never clearly identified there with circumstances of the next life, but with severe temporal judgments upon nations or individuals. We are often told that Jesus spoke more on the topic of hell than did any other person in the Bible. This would not be difficult for Him to do, since almost all the biblical authors were silent on the subject. When Jesus and His disciples preached the gospel to unbelievers, there was little attempt to turn the listeners’ thoughts to matters of the afterlife. While the eternal ramifications of turning to, or away from, God were not entirely out of view, they did not comprise a central thrust of their message. Jesus seldom spoke of hell—probably on less than six or seven occasions out of about forty recorded days of His ministry. He also seldom spoke of heaven, conceived as a place where people go when they die. Unlike our modern preaching, Jesus’ message was not about going to heaven after death. Jesus compared His movement, which He called “the kingdom of God,” to a small seed, or a pinch of leaven, which was destined to expand and to permeate its environment (the earth). Disciples were taught to pray not that they might go to heaven when they die, but that this kingdom would come here, resulting in God’s will being done “on earth as it is in heaven” (Matt. 6:10). It was concern for this kingdom “on earth,” not for a postmortem heavenly home, that was the focus of the majority of His parables, and remained the burden of His teaching to the disciples, even after His resurrection. The same is true of the apostolic preaching in the book of Acts. The gospel that must be preached in all the world as a witness to all nations is the good news “of the kingdom” (Matt. 24:14). Judging from the samples of evangelistic preaching found in Acts, we would have to conclude that the main elements of this message were as follows: Long ago, God made promises to the patriarchs and to David that a King of David’s lineage would be permanently enthroned in David’s place—one called the “Messiah,” or “Christ.” (Acts 2:16–21, 25–31; 3:18, 22–25; 4:11; 10:43; 13:27, 29, 32–35; 26:22). These promises have been fulfilled in Jesus of Nazareth, the Promised One, whom God publicly endorsed by working acts of power through Him before many witnesses.22 3. Jesus had enemies who crucified Him, but God restored Him to life, after which He was seen by witnesses, prior to ascending to His throne at the right hand of God. (Acts 2:23–24, 32–35; 3:14–15, 26; 4:10; 5:30–32; 10:39–41; 13:28–35; 17:31; 26:23). Since Jesus has been enthroned, it is incumbent upon all people to acknowledge His royal prerogatives (or “lordship”), and to repent of their rebellion against Him. To those who do this—embracing Him as Lord and Messiah (King)—He will graciously grant amnesty for all past rebellion. (Acts 2:36–39; 3:19–20; 4:12; 5:31; 10:43; 13:26, 34, 38–39; 17:30–31; 26:23). In Acts 10, the context of this chapter is Peter’s encounter with Cornelius. The normative way God reveals Himself to all humans is through the proclamation of Jesus as the Messiah by a specific individual who takes the initiative to explain the message of salvation to another. This matches up with the biblical data. There are cases in the Bible where people are sincerely religious but still had to have explicit faith in Jesus as Savior and Lord. For example, in this chapter, Cornelius is shown to be a God fearer. He worshiped the correct God. However, he received a vision with instructions to send for Peter and awaited his message (Acts 10: 1-6, 22, 33; 11: 14). Because Cornelius ended up responding to special revelation concerning Jesus the Messiah, he attained salvation. In the Bible, people do experience salvation by the explicit preaching of the gospel (Luke 24:46-47; John 3:15-16;20-21; Acts 4:12; 11:14; 16:31; 1 Cor. 15:1-4; Heb. 4:2; 1 Pet.1:3-25; 1 John 2:23; 5:12). What is the significance of this verse in relation to the name of Jesus? How could Jesus be declared as the only one whom God’s salvation is effected? In the ancient world, a name was not merely what someone was called, but rather the identification of the being and essence of its bearer. Historical verification is a way to test religious claims. We can detect God’s work in human history and apply historical tests to the Bible or any other religious book. The late Anthony Flew said the resurrection of Jesus was the best attested miracle claim that he had seen. Perhaps the most reasonable expectation is to ask when and where God has broken through into human history. What about those people in the Tanakh (the Old Testament ) that never exercised explicit belief in Jesus as the Messiah? What about people like Melchizedek, Jethro, Job and Rahab? In response, it is true that people in the Tanakh did not have explicit knowledge of the death and resurrection of Jesus the Messiah. However, this objection fails to take into account the issue of progressive revelation. The principle of progressive revelation means that God does not reveal everything at once. In progressive revelation, there are many cases where the New Testament declares explicitly what was only implicit in the Tanakh. One of these truths is that Jesus is the long awaited Messiah who takes away not only the sins of Israel, but the entire world (John 1: 29;3:16). That is what we see in Paul’s message in Acts 17. There is no kingdom without a King. In observing the ministry of Jesus, He demonstrated one of the visible signs of His inauguration of the kingdom of God would not only be the dispensing of the Holy Spirit (John 7: 39), but also the ability to perform miracles. If the reign of God is breaking into human history, then the King has come. If the Messianic age has arrived, then the Messiah must be present. Source: Data adopted from Seyoom Kim, Paul and the NewPerspective: Second Thoughts on the Origin of Paul’s Gospel (Grand Rapids: Eerdmans, 2002), 102; cited in John Piper’s God is the Gospel. 5. All of us miss the mark! 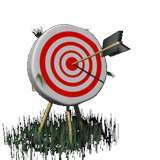 Imagine someone with a bow and arrow who is trying to hit the bullseye on a target but they keep missing. This is a picture of what sin is. The Greek word for sin is “harmatia” which means “to miss the mark.” Sin is missing the mark, falling short of God’s absolute standard of perfection. Sin is going astray, being in autonomy of God. Because of sin, humans have an alienation problem. Alienation means to be estranged or split apart from someone or even a community, etc. Alenation does not allow us to have the harmony and proper relationship with God that he intended. There is a Hebrew word called “Shalom” which means peace, completeness, or wholeness. It can it can refer to either peace between two entities (especially between man and God or between two countries). Why do we lack this wholeness? Sadly, sin causes us to be fragmented. Jesus is the one who offers reconciliation and shalom with our Creator. Guess what? We are living in a day where there is a loss of objective truth. I hope we all know that our faith doesn’t make the Gospel true. My faith won’t change the fact that objectively speaking, God exists or doesn’t exist or that Jesus rose from the dead in the past. The proposition “God exists” means that there really is a God outside the universe. Likewise, the claim that “God raised Christ from the dead” means that the dead corpse of Jesus of Nazareth factually rose from the dead in the context of real time, space, and history. Eternal (“aiōnios”) life can mean unending, but also focuses on the quality or characteristics of that which is age-long or eternal. “Now this is eternal life—that they know you, the only true God, and Jesus the Messiah, whom you sent.”- John 17:3. “Combined with the Greek zoefor “life,“ eternal life is not simply life that never ends, but a fullness of life that is unending. In other words, when people come to faith in the Messiah, eternal life starts today. It isn’t something that starts the moment we die. 1. Edwards, J.R., Is Jesus the Only Savior? Grand Rapids, MI: Eerdmans Publishing Group, 2005, 106. 2. Marshall. I.H., The Acts of the Apostles. Tyndale New Testament Commentaries. Grand Rapids: MI: Intervarsity Press. 1980, 288-290. Testament. Grand Rapids: Baker Books, 1995, 297. 4. Moreland, J.P. Love Your God With All Your Mind: The Role of Reason in the Life of the Soul. Colorado Springs, CO: Navpress. 1997, 25.